Check Valves There are 5 products. PVC Clear Flapper Check Valves Slip x Slip - 3/4"
Our PVC Swing Flapper Check Valves are the highest quality and best made. 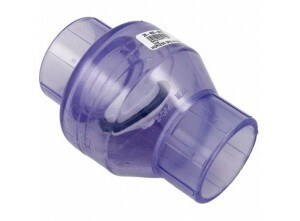 They are an excellent choice for preventing backflow into your water system during routine maintenance. To meet the needs of fishtank and aquarium owners, this model has NO SPRING and thus no metal parts, which can sometimes corrode and cause water contamination. 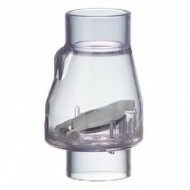 PVC Clear Flapper Check Valves Fpt x Fpt - 3/4"
PVC Clear Flapper Check Valves Slip x Slip - 1"
PVC Clear Flapper Check Valves Fpt x Fpt - 1"
PVC Clear Flapper Check Valves Slip x Slip - 1.5"